Purchasing a home introduces you to a brand new language. 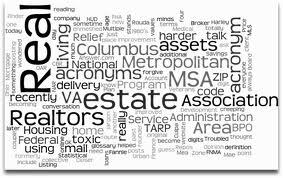 As you talk with real estate experts, you’ll find they use acronyms just like regular words. It can be a little confusing if you don’t know what these stand for. However, there are online resources that will help you understand exactly what these abbreviations stand for. Then, you’ll be able to have a more comfortable and understanding conversation with them. Following is a list of common real estate abbreviations you need to understand. Your real estate agent may mention PMI at some point. This stands for Private Mortgage Insurance and they have strict qualifying ratios to determine borrowing eligibility. You may need a larger down payment than with an FHA provider, but you’ll also end up paying lower premiums. For those who are new to real estate, FHA stands for Federal Housing Administration. They offer loan programs that are more cost effective and easier to quality for at times. MLS is another acronym you may see often and this has to do with the listings of the local houses. Multiple Listings Services means that one agent may put the house on the market, but it can be sold by any number of other real estate agents. The MFP listings in your town will be of special interest to real estate investors. That’s because this stands for Multi-Family Properties and refers to apartments buildings and similar structures. You will of course, run across many other abbreviations and acronyms during the house purchase process, but this should give you a place to start. If you run into trouble, remember there are online real estate dictionaries to review at any time. These are easily accessible and will give you a better understanding without having to ask a lot of questions. By remembering you have these resources, your first home purchase will be less stressful and give you more confidence. As you don’t have to pay for them, they are an essential tool to add to your real estate toolbox.